Stud finders are handy tools when you need to find the framing lumber in a house, to fasten something into it for extra strength. If you play it by the ear instead, drive a nail through any little patch of wall, chances are all you will hit will be anything but the frame. So, when you really need to find the bones of your house, the best and fastest thing to do is to use a stud sensor . What is a stud finder though, and how does it work? Well, these handheld gizmos emit electric fields that go through the wall or floor. Any changes in the field are detected by the instrument as you slide it over a surface. Any material that has a higher density than air changes the strength and nature of the field and the instrument tells you that you have reached lumber. Newer models can even find electrical wires or pipes or help you find metal in concrete. There are any number of models and makes available on the market, and one cannot blame the homeowner and the do-it-yourself enthusiast for being confused and disoriented. What do you buy? Which ones are the best for your needs? What does each type do? How user-friendly are they? The type I use the most is the Zircon stud finder. Zircon has a couple different models and I prefer zircon because of the compact size for carrying in my tool belt and availabilty in my area. There are any numbers of questions that demand answering before you can bring home the tool. So, here are some good options to consider while you shop for your next stud sensor.
. The stud sensor Zircon Professional multi-material finder has a normal as well as deepscan mode, a metal sensing mode to locate material like pipe, rebar, etc and an alternating current(AC) scan mode for house wiring. 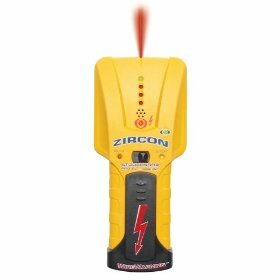 The zircon stud finder comes with an LCD display and is available at most hardware stores and home centers.
. The Sears Craftsman approach-reading stud sensor is a simplified instrument, with a deep scan option, that's ideal for the not-so-mechanically-inclined. It calibrates by being held up to the wall while powering on.
. The Ryobi stud-approach LED and tape measure is a combination stud sensor and tape measure that combines 8-ft. of tape with a stud sensor to make handyman work around the home seem easy. It scans automatically to maximum depth and calibrates in 4 seconds.
. The Strait-Line stud finder is a self-marking stud sensor . A handy recessed surface can incorporate the company's laser level for extra convenience. The instrument has automatic switch on capacity that activates as you press it against a surface.
. The Stanley combination IntelliSensor DigiScan finds wood, metal and wiring, without changing modes. The sensitivity can be changed to reach different depths.
. The Black & Decker's Bulls Eye is a combination laser level and stud finder, simplifying the process of finding as well as marking frames for things like installation of shelves and cabinets.
. The Gardner Bender stud seeker and bullet level is the size of a fountain pen but just as accurate as tools twice as expensive and large. It activates and calibrates by powering on when placed on the surface you wish to check. There is also a bubble level and four 1.5-volt button-cell batteries. Consider the pros and cons of all the available models, compare it to exactly what you need, consider what you mean to use it for, and make a wise choice when shopping for stud sensors. Return From the Stud Finders Page to Home - Finishcarpentryhelp.com.